Y'all ever... get real mad at Bioware when they write normal NPC conversations for male PCs and then have those same NPCs make weird inappropriate comments to female PCs and then make a mod about it? 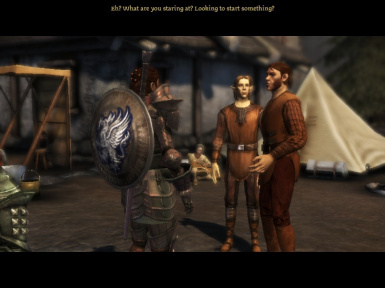 This is just a simple dialogue tweak that makes Colbert respond to all Wardens how he does to male Wardens in the vanilla game, as opposed to the ""Looking for some company, honey-pie? I'm always available for riveting conversations with fine women" line that female Wardens get to hear (plus his follow-up assumptions that a woman introducing herself as a Grey Warden or asking him about darkspawn is trying to initiate sexual roleplay with him). Threatening to rivet him to the floor was fun the first time but you know... He just Keeps Going. Female Wardens won't be misgendered, since Shockingly, there was nothing about the male version of the dialogue that necessitated different dialogue for female Wardens. Go forth and progress the main quest in peace.